December has been, by all accounts, a fairly cultured month. I recently saw a great play and who better to share it with but you! My mum was coming to visit for a few days and we wanted to take in as many sights and sounds as we could cram in to the space of a weekend. 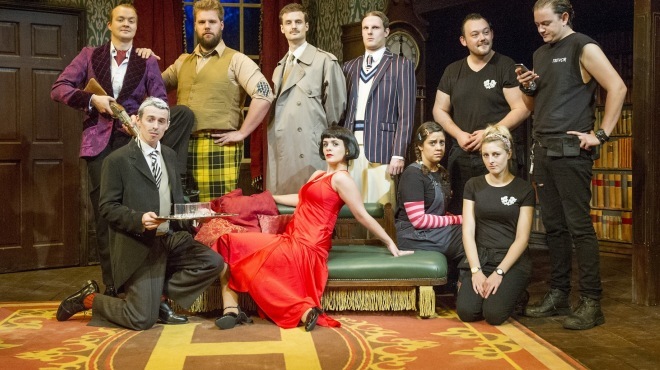 Enter my friend Danielle who recommended The Play That Goes Wrong which is currently playing at The Duchess Theatre. Danielle and I met when we worked in a theatre up in Scotland and her passion for the arts has led her to the bright lights of the West End where she now works. She’s seen the play a thousand times and still gets a belly ache from laughing at the gags which, in my books, is a sure fire sign we’re onto a winner. The play itself is the first presentation of newly expanded Cornley Polytechnic Drama Society. For the first time in the society’s history the troupe have secured sufficient actors to reach for the stars with the premiere of ‘Murder at Haversham Manor’. Boasting an all-star wannabe cast of amateur actors – half of whom appear to have been strong-armed into participating in the show – the play has a constant spell of bad luck from the off and despite the best efforts of Duran Duran megafan and chief electrician, Trevor and put-upon director Chris, the spell fails to lift despite the cast’s best efforts to keep calm and carry on. The humour is completely farcical and it’s impossible not to laugh at the thespians’ misfortunes as they bravely battle to ensure the show must go on. Anyone who’s ever been in an am-dram society will recognise the characters from pseudo-saucepot Sandra who’s convinced it’s first stop Cornley, next stop Hollywood (provided she doesn’t collapse under the weight of her own ego.) Then there’s serious veteran ac-tor Robert who rates himself above all others and poor old Dennis who valiantly tries to remember his lines with only the very occasional glance at the notes he’s written on his hand. My personal favourite has to be stage manager Annie. An underdog of sorts we witness something of a metamorphosis from the shy and retiring behind the scenes troubleshooter as she blossoms into the leggy love interest all the boys are after – much to Sandra’s disgust.